The National Agency for Food and Drug Administration and Control (NAFDAC) has warned Nigerians to beware of expired products which have been illegally revalidated and pushed into the market as they could lead to terminal diseases such as liver and kidney diseases which are currently on the rise in the country. 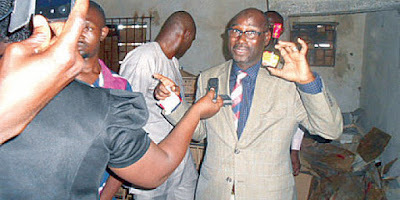 NAFDAC reiterated the notice during the week when it uncovered an illegal factory loaded with various expired condiments worth millions of Naira even as it arrested a 24 – year- old, Victor Ebuka Okeke in connection with the expired products. This was following a special raid and enforcement operation in some markets in Lagos by the Investigation and Enforcement Directorate of the agency. The factory which was originally a one- room shop was used to stock and revalidate expired food products, particularly food condiments. Leader of the team and Assistant Director, Enforcement Directorate, Mr. Shaba Mohammed exhibiting an expired condiment during the raid in Lagos, recently. Some of the expired products discovered in the unhygienic factory include expired Maggi Sauce with manufacturing dates 15/08/2011 and expiry dates 15/08/2014; Amoy Dark Soy Sauce, Costa Corned Beef and Exeter Corned beef among others. For the Costa Corned Beef, whether expired or not, the 24-year -old suspect changed the labels to Exeter Corned Beef. According to him, this was to make consumers patronise the corned beef because having the name Costa does not attract much consumers as much as Exeter does. Addressing journalists shortly after the exercise in Lagos, the leader of the team and Assistant Director, Enforcement Directorate, Mr. Shaba Mohammed, said the Agency has been on the trail of the alleged owner of the factory, Victor Ebuka Okeke, following an intelligence report on his activities in the market. Mohammed told journalists that the suspect, who also claimed to be the managing director of the factory, was caught revalidating expiry dates of Maggi Arome sauce and Amoy Soy sauce smuggled into the country from Ghana with expiry dates of 2014 to August 2016. According to him, the products expired since August 15, 2014. “The suspect was also caught changing labels of Costa corned beef to Exeter corned beef,” he added Mohammed who said the suspect has refused to give useful information regarding the whereabouts of over 902 cartons of expired Maggi sauce already pushed into the market said the agency will be charging the suspect to court for counterfeiting. “We have arrested the suspect and also evacuated the remaining products in the illegal factory. We are also charging him for counterfeiting. Some of the products were not registered by NAFDAC. The products were smuggled in from Ghana. What we found on ground here cannot be consumed. We saw two drums filled with ordinary water which he uses to immerse the products and the labels will remove without any trace are and replace with new labels.” Lamenting that most of the revalidated products have been pushed into the market for unsuspecting consumers to buy, he said consuming such products could lead to terminal diseases such as liver and kidney diseases which are currently on the rise in the country. He further explained that the sauces are sodium- based products that could lead to hypertension if consumed. The Assistant Director also hinted that the police attached to the agency will immediately take the statement of the suspect as the case will be forwarded for prosecution and suspect arraigned before a court. “Also the products evacuated will be used as exhibits in court. Every single thing that is here are dangerous to human health.” Responding to questions from journalists, the suspect, who hails from Njikoka in Anambra State, claimed he was forced to revalidate the dates in order to recover the money he spent in importing the products. This story was published in Newswatch Times on August 8, 2015.